Another oddball attempt. Only time will tell what the longevity of this is. DH is an app developer. The result of that is that we have LOTS of iPads. LOTS. Six? more if you count the various android tablets. He was happy for me to experiment on one of his old covers (it was actually the one I doodled on with Sharpies. It was a bit bet up, hard use and all, so I started by carefully wiping off as much of the doodling as I could, using Blending Solution. Not a perfectly clean slate but not too bad. Once it was a good as it was going to get, I wiped it down then masked off the channels that are meant to fold with some very thing washi tape – this is the stuff that he bought me at Christmas last year and got 5 sets all the same. 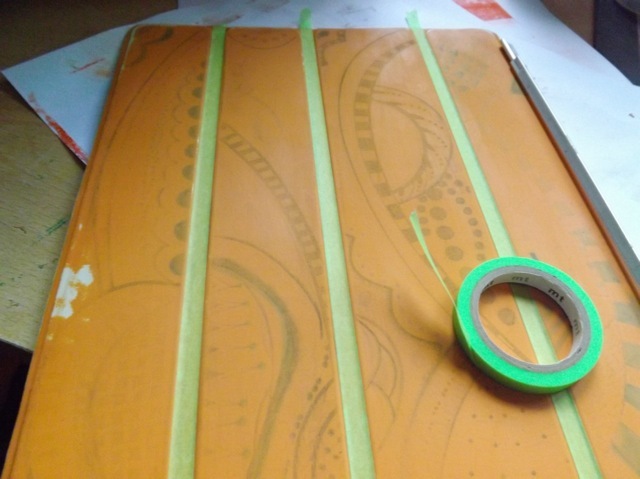 I can’t really think of a use for thin, lime green washi tape (certainly not 5 rolls of it!) so I didn’t mind using it. I added of coat of Gesso to the surface. Not sure if it gives any benefit. 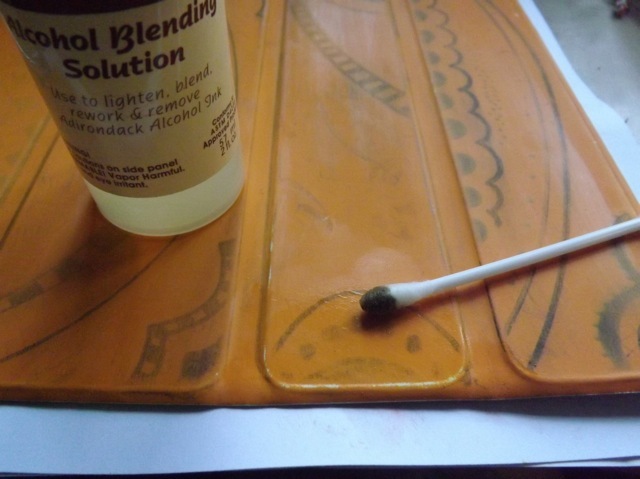 I thought it would help the paint adhere but it didn’t – more on that in a bit. 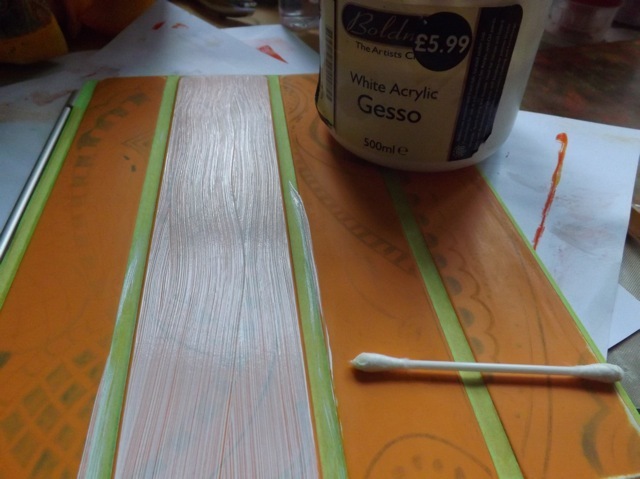 I also carefully swiped away the paint from the channels and off the Washi tape. The first time I did it, when the paint overlapped the tape, when I pulled off the tap, the paint simple peeled off the surface of the pad. So back to square one. Worth it, as it tells me if you mess up you can easily get the cover back to what it was with little or no damage. 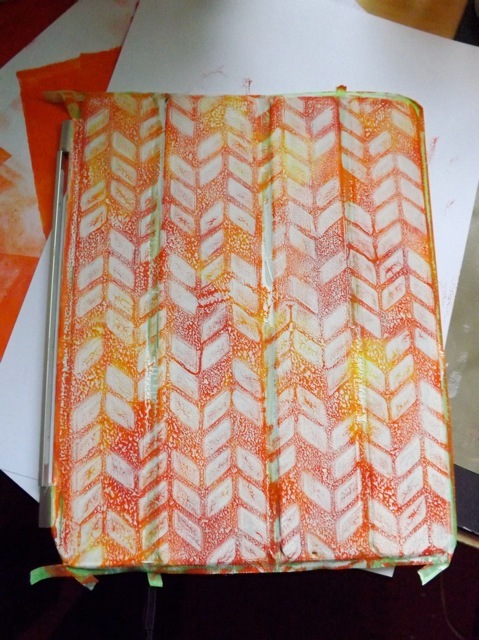 I prepped the Gelli plate and pulled a print. Do cover the back of the pad with paper, as this is a surface that will come n contact with your iPad and you don’t want mucky fingers full of paint smearing it all over that! It wasn’t perfect but it was interesting and I liked it well enough to carry on. I ended up messing up panel 3 and you can see later that panel has a different print on it. 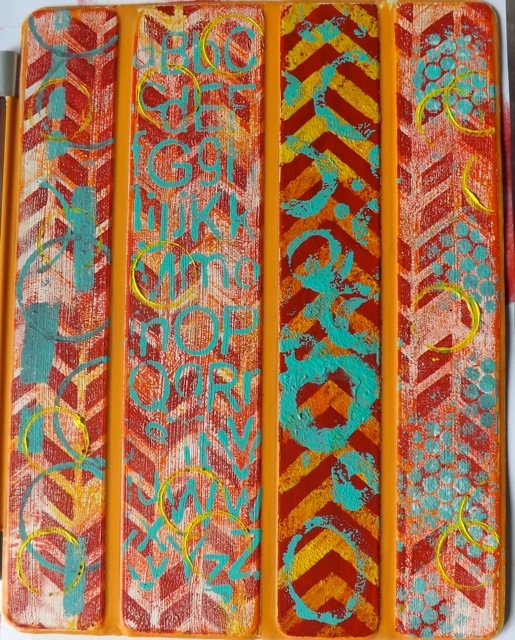 I tried, for the re-do, just brushing on red paint and using a stencil on it then a stamp over it, rather than doing the Gesso layer and a Gelli print. I’m curious to see if it makes any difference to the stability of the print. 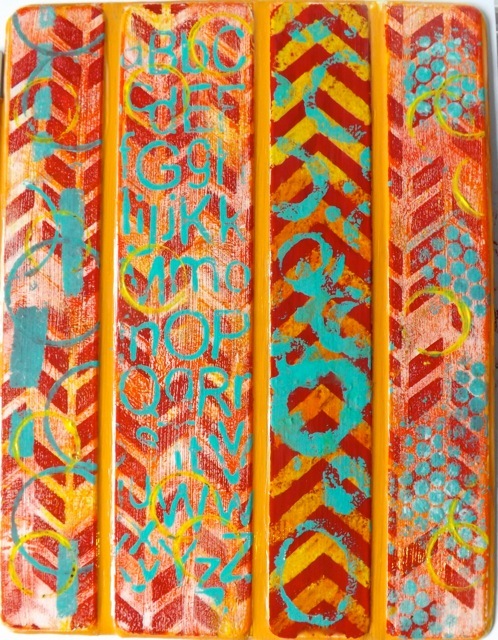 I added to that – mostly stamping or stencils. See panel 3 here? 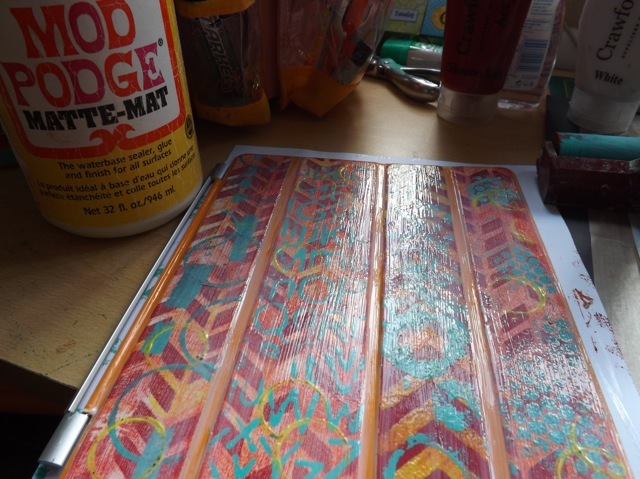 After that was dry (took a long time) I added a coupe of coats of Mod Podge, making sure the y covered the channels as well – there needs to be no area where the paint can be loosened or it will peel off, I’m sure. Dry between coats. I’ve done three so far but am considering doing the suggested 5 coats they having a go at wet sanding it VERY LIGHTLY to see if I can get a smooth, no brush-stroke finish. In truth, it may compromise the seal and the paint may peel off, but it’s only an experiment so I don;t really mind if that happens. I’m not going to get another cover to play with so making this one a few times is OK by me! The Mod Podge is matte, so it’s less shiny than the tape. On the plus side, DH has been using the iPad mini cover with the packing tape addition and it seems remarkably stable. No peeling at all. I do wonder what the effect might be of lightly sanding the tape to knock back the shine? I’ll let you know how the sanding goes, and how it performs in use. These covers are not cheap, so it isn’t something to do as a lark, IYKWIM. But if it holds up, and works in situ as a stand, like it should, and the Mod Podge doesn’t crack, or keep the cover from folding then I’ll let you know. Another thought I had was using something like Plasti-coat spray on it as the base layer. That COULD work, although I will probably have to either ruin this cover during the wet sanding step OR wait for DH to beat the heck out of another cover before I get to try that! 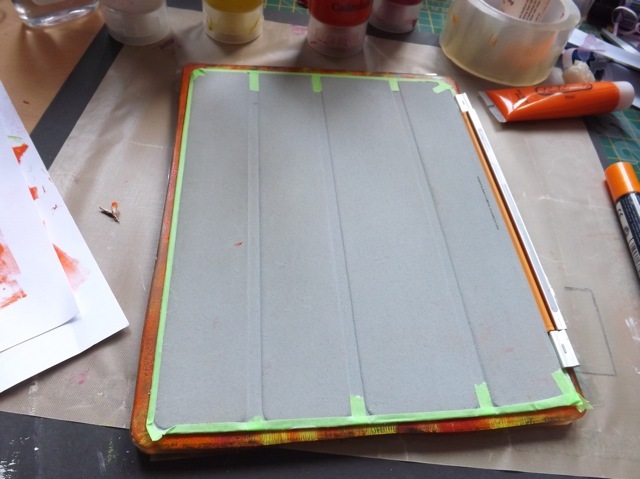 Categories: Gelli plate monoprints, iPad cover | Tags: Gelli plate, how-to, iPad cases | Permalink. I had to jump ahead here to see more about the Ipad painted covers. I like that you are willing to experiment and see what works and try different things. I totally want to know it will work the first time I do it… yeah, I get disappointed a lot but hey, it’s still fun.